We love breakfast wraps around here, the recipe is easy to change up too. Check it out.. When the meat is cooked through and potatoes, peppers and onions softened, either scramble the eggs in a sperate pan or I just push the meat/potato mixture to the sides of the pan then scramble the eggs in the middle. Eggs could be left out all together as well. Serve on wraps, top with cheese, roll up and enjoy! Everyone loves these, even the kiddos. 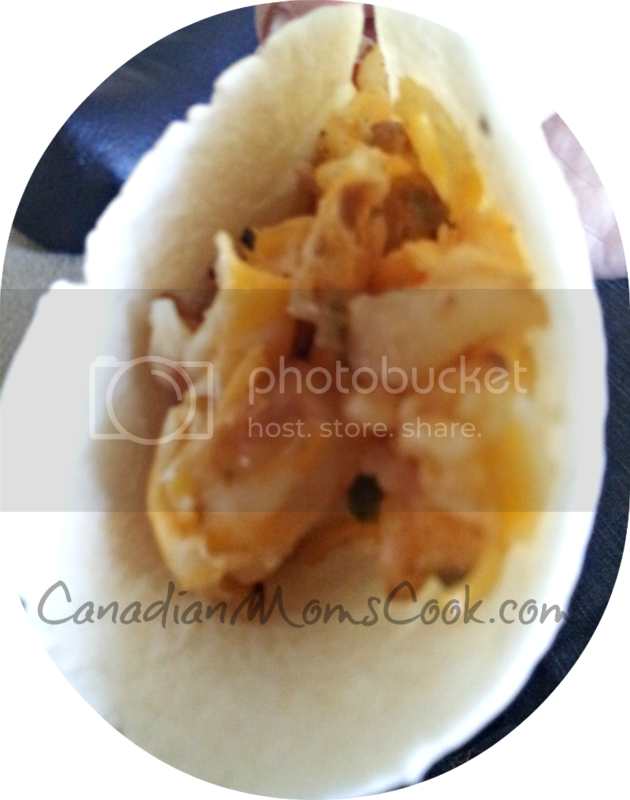 Extra can be made, wrapped in foil and reheated later! Make a drink extra special by adding a few frozen berries to it! Are all the adults having fancy drinks during the summer and the kids want something special? Add frozen raspberries to Gingerale, 7up, Sprite, Orange Juice, Lemonade or White Grape Juice! Having a glass of fruit wine? Add some frozen raspberries, blueberries or peaches to keep it extra cold, look extra special and enhance the flavour! Whip up a quick berry smoothie in the morning with a handful of frozen berries, ice and orange juice or lemonade! I've had chipotle sauce and chipotle spice before, but I was never sure what to do with those cans that say chipotle chiles in adobo sauce in the Mexican section of the grocery store. One day I got brave, looked it up and figured it out. 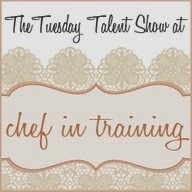 Here's some info and a tasty recipe! What is "chipotle chiles in adobo sauce"? Chipotles are dried, smoked jalapenos. Adobo is a tangy, slightly sweet red sauce. They are put together in a can and are delicious! 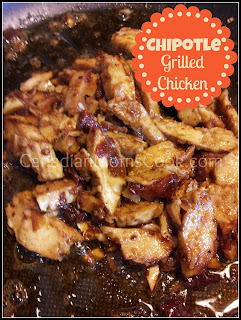 These chipotles can be VERY spicy, you could even skip the jalapenos and just use the sauce in your recipes. But if you are looking for heat take a chipotle out of the can and chop it up, you are good to go to add to to your recipe (just do NOT touch your eyes!). If you want a little heat slice the chipotles open and scrape or rinse out the seeds, if you are only looking for a little heat just add one to your recipe and taste before increasing the amount. The chipotles and sauce can be removed from the can and stored in the fridge for later use, so don't feel bad about opening the can for 1 jalapeno and some sauce. I LOVED it, hubby and one of my sons liked it, one of my other guys wanted nothing to do with it..haha.. I think it's delish though and I'm excited to have a new dish. I'll be researching more things to do with chipotle chiles in adobo sauce. Great on the bbq, a tasty way to cook chicken this summer. 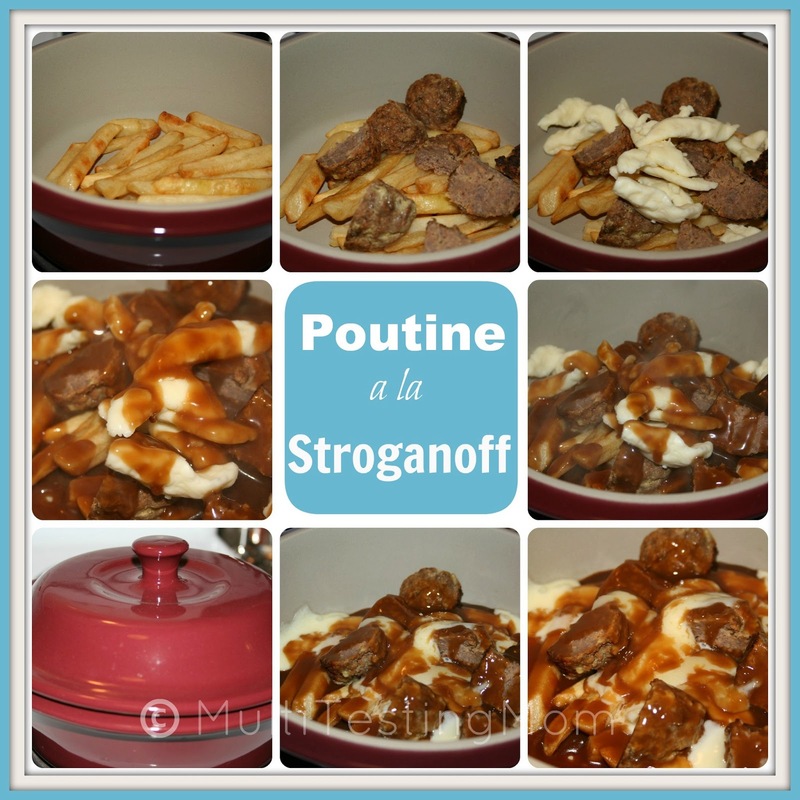 I wasn't sure if the kids were going to be picky about this one, but they loved it, so did my husband and I, very flavourful! 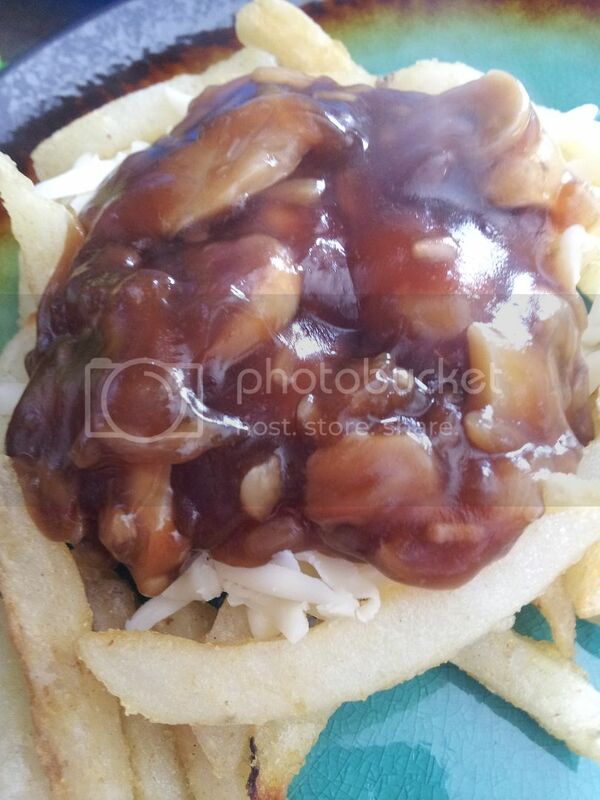 Did you know that Poutine is a traditional Canadian dish? FUN EVENT - June 5th, 2013On Wednesday, June 5th, Food Network’s John Catucci will be hosting Dine & Dish with Dawn - a pop-up poutinerie at Yonge-Dundas Square in Toronto, where the poutine is free if you clean your own dish with Dawn Ultra. That’s right; if you eat it –you clean it! 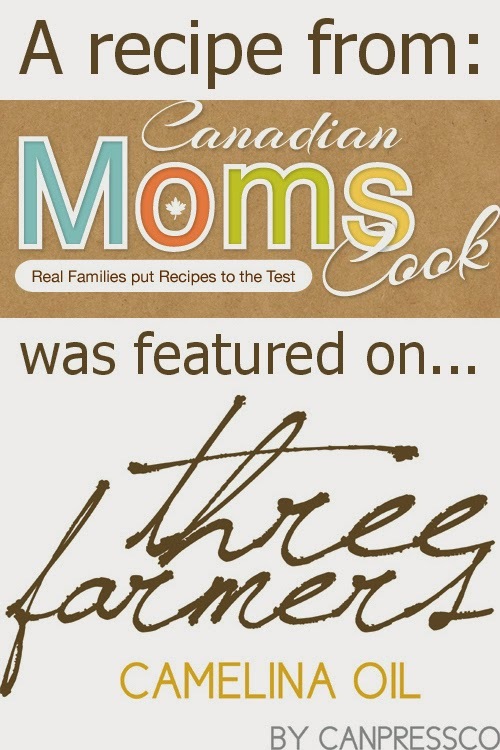 Leading up to this event, PGMoms were invited to create their own poutine recipes! Of course, with poutine comes a huge, messy cleanup. We put Dawn to the test and had a super easy and efficient clean up! We are P&Gmoms. As part of our affiliation with this group we receive products and special access to P&G events and opportunities. The opinions on this blog are our own. I had no idea how quickly you could make donuts at home, it's been fun experimenting with different coatings! Well the kids just loved then of course! 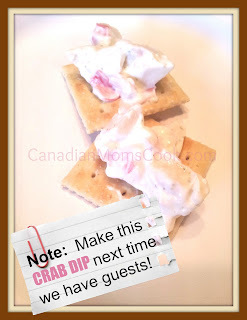 A fun afternoon treat and the kids can do the toppings themselves! Have you seen what Philly has on the shelf for us? Chocolate Philly! Can you believe it? It is so good, easy to spread and with Chocolate Philly you get the dairy goodness of Philly plus the deliciousness of pure milk chocolate – with half the sugar and calories (per 1 tbsp. serving) of the other guys! Your friends will start liking your post and it's all up to your family now! 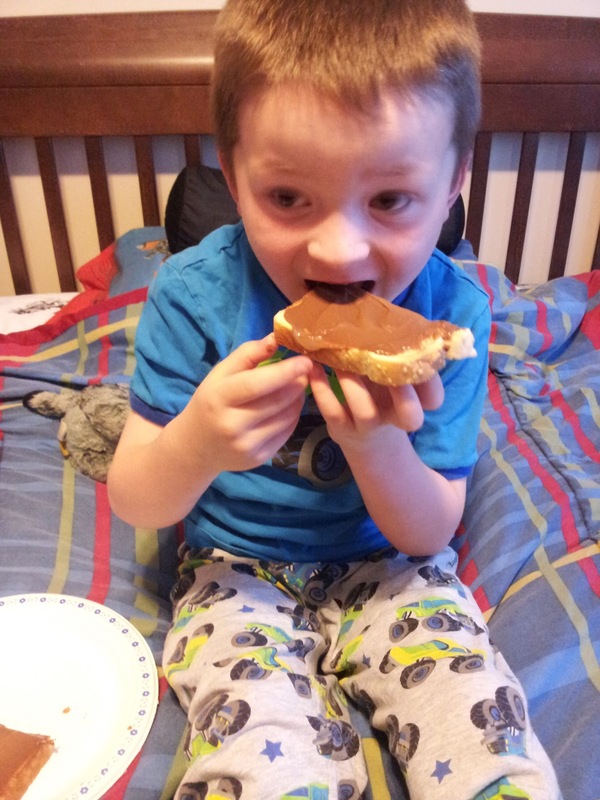 When your family serves you breakfast in bed with Chocolate Philly, take a photo and submit it to the Philadelphia Cream Cheese Canada Facebook page - how fun is that?! I decided to do a taste test in bed with my little man and it was deeeeelish! Every once in awhile we spend Sunday mornings with all the kids piled on our bed with books, a family movie, drinks and snacks. How perfect would it be to enjoy Chocolate Philly on toast, or maybe dip some strawberries in it, yum! Let us know if you take Philly Canada's Breakfast in Bed Challenge, and don't forget to grab the coupon! I love traditional breakfast, brunch and "breakfast for dinner" foods! I think it's that combination of salty and sweet that gets me every time. This is why Bacon Wrapped French Toast Cups are so appealing to me. This recipe got a huge thumbs up from my Mom, sister and my kids! We all loved it. Fry bacon strips for a couple of minutes (should not be fully cooked) in a fry pan or in the oven. Pat any grease from the bacon with a paper towel. Wrap bacon inside muffin tins (we use our stoneware muffin pan, but if you are using metal, you may consider lightly greasing the sides first). Whisk together the milk, eggs, sugar, vanilla and cinnamon. Add bread cubes and combine well. Fill muffin cups with egg/bread mixture and press down (cup should be approximately 3/4 full). Combine the topping ingredients, use a pastry mixer or a fork until butter is pea sized or smaller and sprinkle on top of each muffin cup. Bake in 350° oven for approximately 35 minutes or until tops are browned. 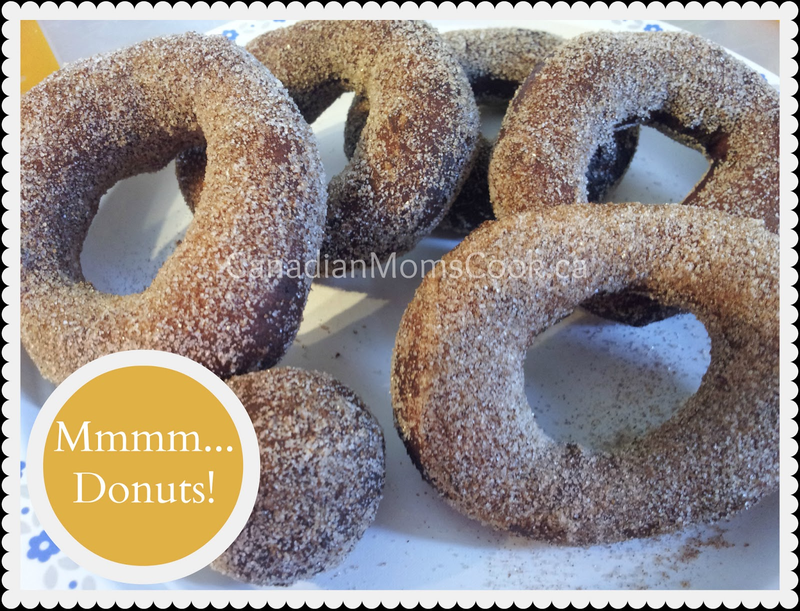 These are delicious served with fresh fruit and pure maple syrup! This is a super fun way to serve French Toast to the family. This version is sweeter than your traditional French Toast because of the added sugar and the crumbly topping. It makes for a great brunch item! 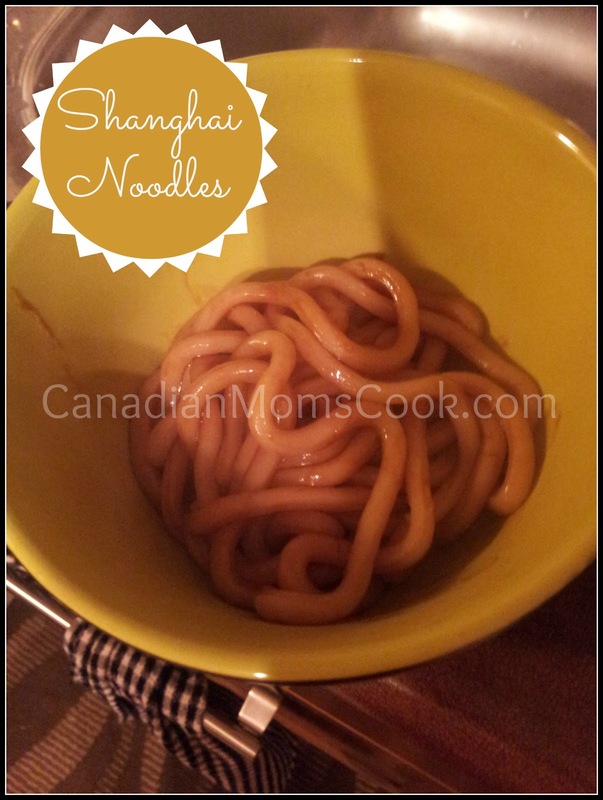 I love homemade Asian style meals, here's my recipe for Shanghai Noodles. At this point you can serve or add anything you want such as bok choy, bean sprouts, green onions or water chestnuts would all make great additions! We love these noodles and have them often, so easy to change up the taste and ingredients. The key to making gyro meat that doesn't turn out like a "greek flavoured" meatloaf is in the texture. 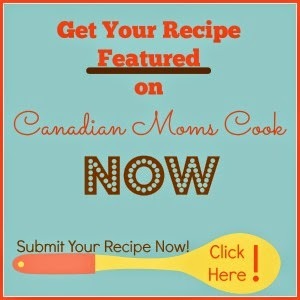 In order to gain a proper texture, I recommend you using a food processor, like a Cuisinart. You could also likely use a tool like a hand mixer if that is all you have. Mix ingredients together until you see a WELL MIXED mixture. 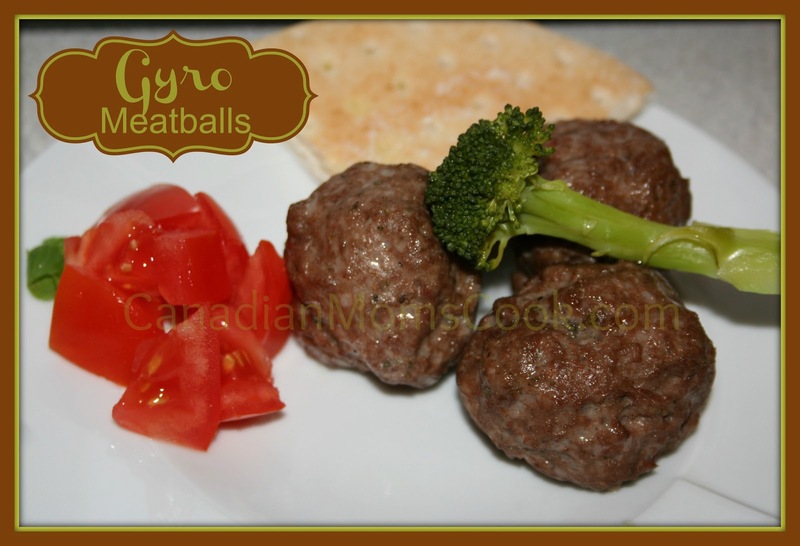 Form meatballs (approximately 2 Tbsp of meat in each) and place in any rimmed baking sheet/pan. We like to use stoneware for this as it makes for an easy clean up, however you can line metal cookie sheets with foil if you prefer. You can also use a 9x13 rectangular baking dish. Bake in 350 degree oven for approximately 25-30 minutes or until internal temperature reaches 160° F.
Baking times vary pending on the size of the meatballs. This recipe makes approximately 18 meat balls. The family devours these meatballs every time we make them! Thank you to Hubby, who came up with this recipe and has tested it over and over until he reached this one, the final version! 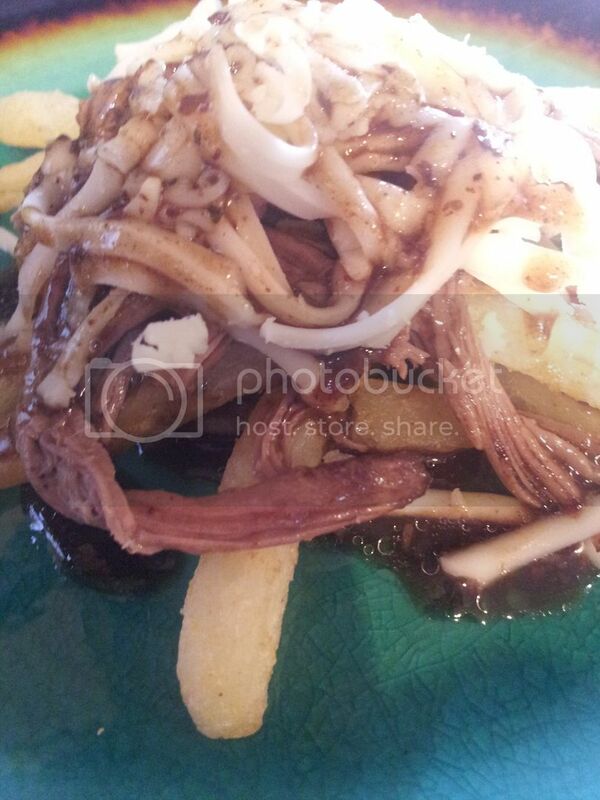 We have also made traditional gyro meat with this recipe! I will write another post with those instructions soon. We enjoy serving these with traditional Greek fare like rice, greek pitas, greek salad, feta and tatziki. 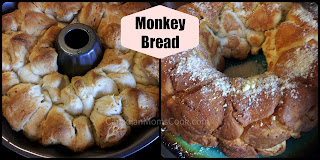 When I saw this monkey bread going around pinterest, I knew I had to try it, here's how I did it.. 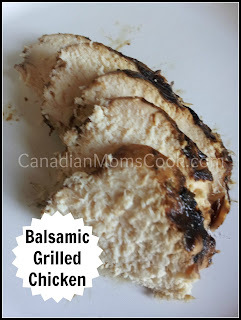 The kids thought this was a fun one, great for a party this summer or any big family meal! 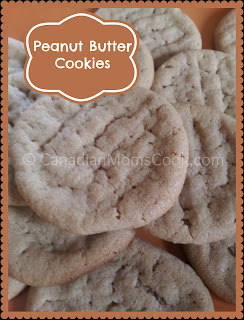 Well my kids don't like peanut butter (I know, they are CRAZY) but that means more for me and hubby and we love them. I also love how easy and quick they were to make! My Mom used to call this Christmas bread because of the flecks of green colour that we used to question, somehow we always believed her OR we just didn't care because it tasted really good! The chocolate masks 99% of the zucchini taste, so this bread is definitely a great way to sneak some veggies into your picky, little eaters. I'm not suggesting it is healthy BUT if you do cut down on the sugar a bit, I believe it does make a great snack! Gradually stir in sugar, then oil, then vanilla. Stir in zucchini and melted chocolate. 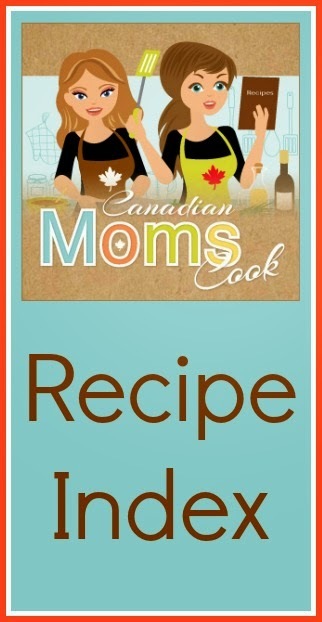 Mix or sift flour, baking powder, baking soda and cinnamon together. Stir into batter. Add raisins or nuts if desired and gently stir. Pour batter into two 8x4 greased loaf pans. Bake for 45 minutes or until toothpicks comes out clean. Cool in pans for 10 minutes, then turn out onto wire racks for remainder of cooling time. We love this bread. 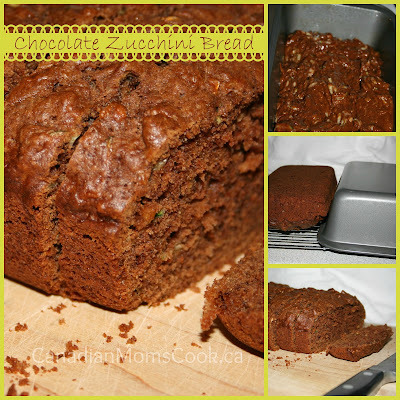 It is so delicious and it truly tastes like a treat, not like we are eating zucchini! This bread freezes well for school lunches and I just love how the children think they are getting a HUGE treat when they find it in their lunch at school. 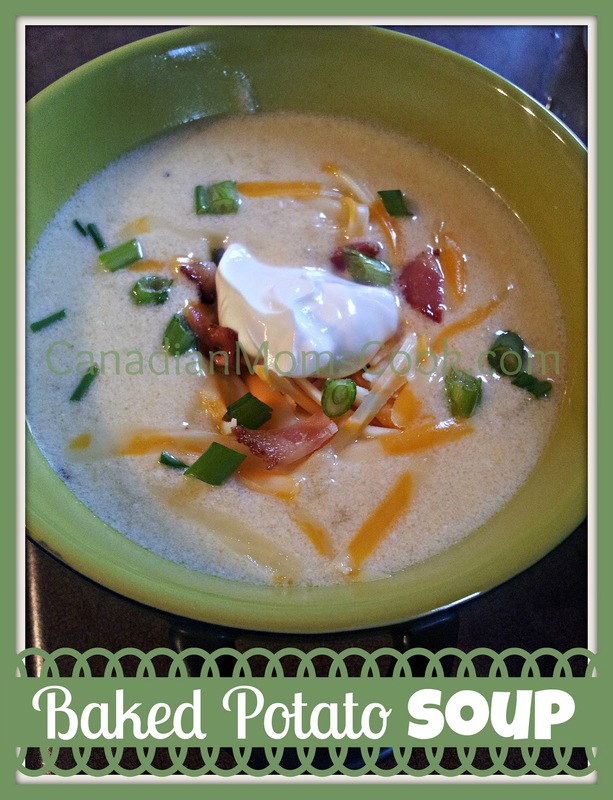 I love this soup, it's easy to make, makes great leftovers and has tons of flavour! So good, we love this thick soup, it's filling and delicious! Even the kids enjoy. The following recipe has been re-posted in our own words with permission from the cookbook: Slow Cooker Desserts by Jonnie Downing. My four year old son and I enjoyed making chocolate cake together. I have to say, however, that I cannot take any of the credit because he did most of the work! What an exciting opportunity for him. Note: The conversion of 1 pint into ml comes to 473.176ml which is shy of a 500 ml container. I used all of the sour cream in a 500 mL container except for approximately 3 Tbsps. Technically these steps can be done in any order (as you can see in the image above). Combine all ingredients in a large bowl. Use a whisk to ensure mixture isn't lumpy. 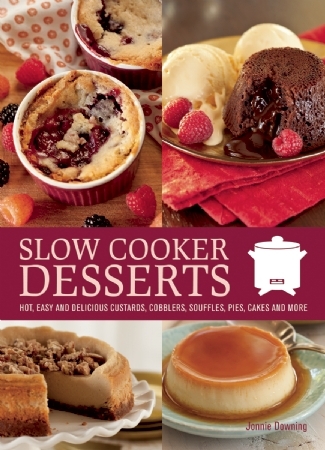 Pour cake batter into slow cooker. Cover and cook on low for approximately 6 hours or until a toothpick comes out clean(ish). Cool for approximately 30 minutes and invert onto a serving platter. I typically rely on testing whether or not a cake is done by using the "clean toothpick method". Not this time! The cake literally slipped right out of the crockpot, a wee bit too fast. Next time, I would find a platter that fits over top of my crockpot and I will flip it up side down onto the platter to avoid what happened in the image above! My four year old son was SO proud that he made a cake all by himself! Because of this, of course he sat proudly eating his delicious cake with a smile that reached ear to ear! The rest of us loved the cake too. 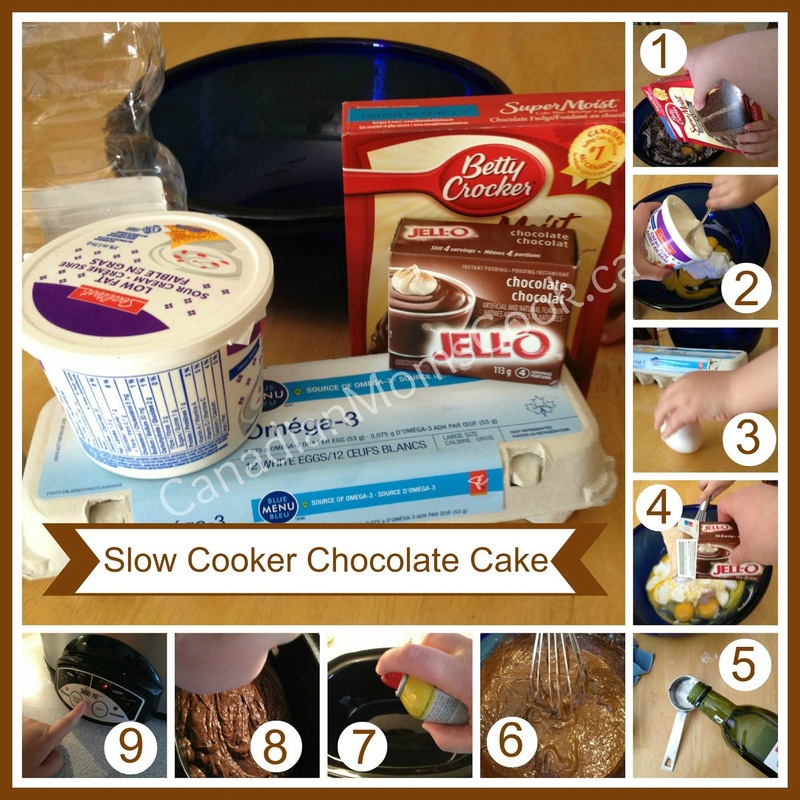 While I typically don't make cakes with a box mix (in fact, my son asked me what that box was...that was a proud moment), this cake is super easy to throw together if you are entertaining and don't have the time to make your own cake from scratch. The cake was super moist, but not so moist like it was pudding, which is a common complaint I hear often about making cakes in the crockpot. It lasted for 3 days and on the third day, it tasted just as fresh as the first. Whenever I'm baking potatoes I always throw in an extra few to make fried potatoes the next day. Great for either breakfast or a side at dinner. Serve hot on their own as a side dish (we like it topped with sour cream) or along side bacon/sausage for breakfast. 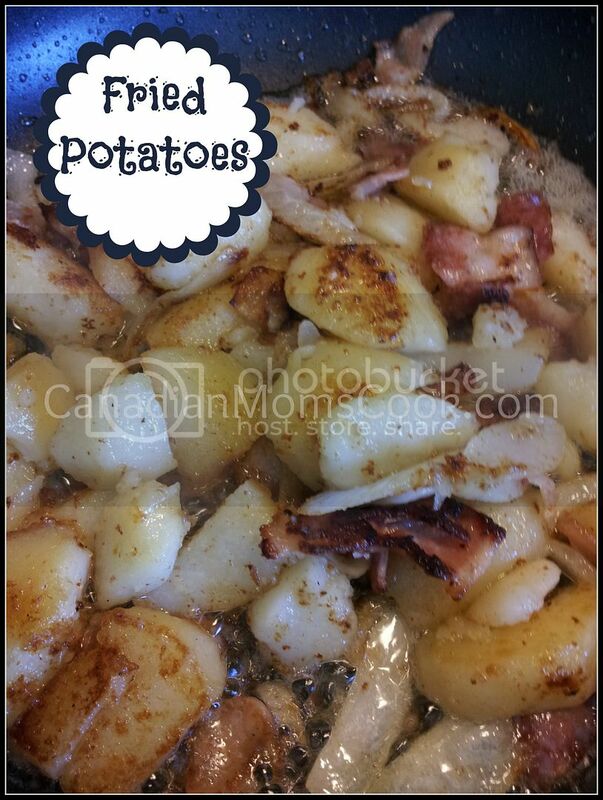 A great way to use left overs, everyone in my family loves fried potatoes the next day! I didn't come up with this one, it was a sample at Costco and we really liked it, see how it's made..
We loved it, even the kids enjoyed it. 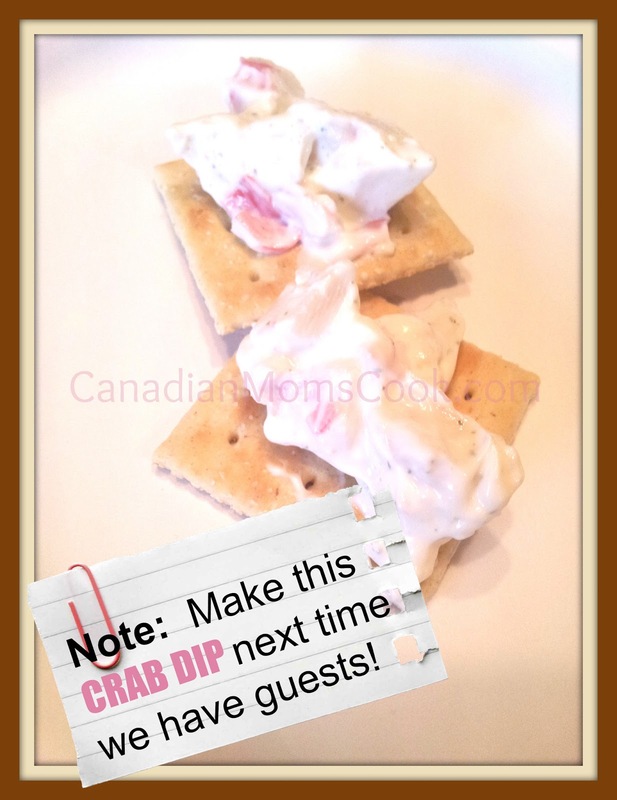 What a simple recipe to whip up for guests! It’s official – aside from a few miscellaneous items, our kitchen cupboards are completely bare! Two more sleeps until our move!!! Ok so…the mac and cheese was too good to be true. It was great that I didn’t have to cook the pasta in advance, however this caused the whole casserole to sort of mesh together into one big pasta lump. In other words, the noodles weren’t separated as in ‘normal’ mac and cheese. My husband said it was like ‘glue’! Darn. I’m not giving up on the Crockin’ girls though as their pizza recipe turned out great! They do have a few more mac and cheese recipes on their website that are worth a try once my pots are back in commission. 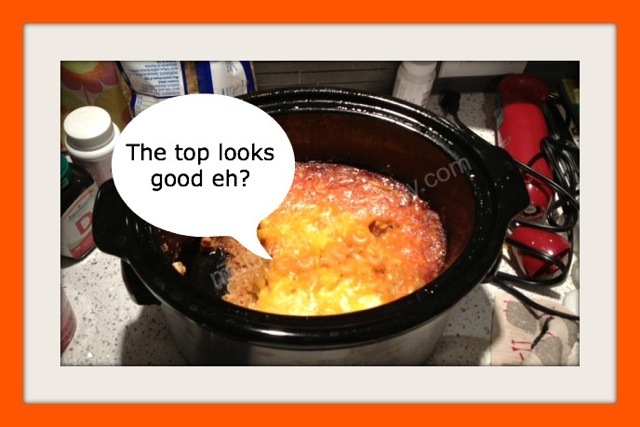 If you have a tried and true mac and cheese recipe for the crockpot, I’d love to hear about it! Thanks again for joining me on this week long crockpot challenge. As I sign off, the crockpot is soaking in the sink for the last time until it finds a new home in our new place.